A couple of months ago, I planned out what I wanted to read to the boys during the month of December. It's nerdy, I know, but if you don't plan ahead, the holds don't come in on time and the month flies by, and you find yourself in January when holiday books just don't carry the same kind of magic. The only problem is, I was so busy planning what we were going to read in December, I kind of neglected queuing up any other books, so we may have a bit of a dry spell. We'll see if anything ends up under the tree tomorrow to fill the gap. Noisy Village isn't actually a village: it's three farms strung together in a row. There's North Farm, where Britta and Anna live, Middle Farm, where Karl, Bill, and Lisa live, and South Farm, where Olaf and his baby sister, Kerstin, live. The book chronicles some of their adventures during the course of a year, told through the eyes of Lisa. This book is just charming and delightful in every way. 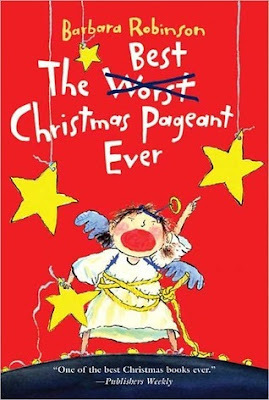 You may have noticed that it's by the same author who wrote Pippi Longstocking, which we also loved. However, if Pippi was a bit too outrageous or spunky for you, Noisy Village would be an excellent alternative. While the children are by no means perfect angels (they dawdle coming home from school and tease one another and have little quarrels), their default is to be kind rather than mean and respectful rather than bratty. The Christmas chapters are wonderful, and I was so glad we read it right now. There's a big snowstorm, ginger-snap baking, tree-cutting, traditions, gift-giving, and all sorts of descriptions that made my kids wild with anticipation for our own Christmas. I will warn you that there's a one-sentence Santa-spoiler you might want to be aware of if you're not planning on answering any difficult questions. In Sweden, where the book takes place, a family member dresses up as Santa and hands out the presents, and Lisa admits that she used to think "there was a real Santa Claus, but [doesn't] think so anymore." 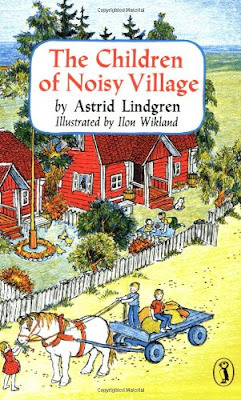 I just felt like Astrid Lindgren captured childhood so well. I loved the interactions between the boys and the girls, and there were several times when just the littlest thing would make my kids laugh out loud.This was one of my favorite paragraphs because its description of boys was just so spot on: "In the winter the boys usually throw snowballs at each other during recess. In the spring they shoot marbles, and the girls play hopscotch. When the boys have nothing else to do they fight, and during class they get into all kinds of mischief, whether it's winter or spring. Miss Johnson says she thinks there is something that makes boys' fingers itch so they can't help doing mischief." 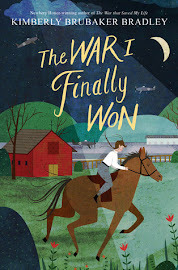 If you're already a fan of Little House on the Prairie or Betsy-Tacy or All-of-a-Kind-Family, add this one to your list because it will fit right in. 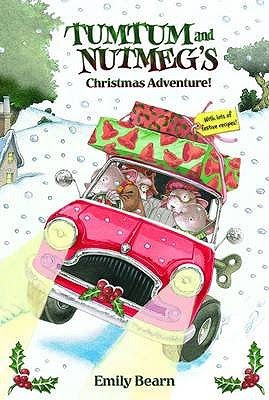 There are some stories I've been intending to read to my kids for a long time, and the adventures of Tumtum and Nutmeg are among them. It seemed like they kept popping up on various lists, and every time they made another appearance, I'd think, I have got to make those books a priority before my kids get too old for them. When I realized one of the books was a Christmas story, I knew I'd finally make it happen because I take holiday reading very seriously and am always looking for books to fit into our December reading list. Tumtum and Nutmeg Nutmouse are a darling mouse couple who live in Rose Cottage. As they're making preparations for the upcoming Christmas holiday, they can't help thinking about the two (human) children who live in the same house. They find their letters to Father Christmas and realize he never visited them last year because their chimney was all bricked up. The mice are determined to make this Christmas different from last year's even if it means getting the presents for the children themselves. They've asked for very simple things (a toy car for Arthur and a box of magic tricks for Lucy), and the Nutmouses happen to know that Baron Toymouse has an entire roomful of toys at Grimsby Hall. Unfortunately, Baron Toymouse is selfish, childish, and extremely mean and not likely to feel generous toward two deprived children, which makes Tumtum and Nutmeg very nervous. Still, driven by the Christmas spirit, they decide to make the attempt. The story was short and cute, and every chapter ended with a cliffhanger of some sort, so we got through it very quickly. Although we enjoyed it, I think we would have liked it even more if we'd already been acquainted with Tumtum and Nutmeg and some of their adventures. That said, I don't think the stories are necessarily chronological (although if any of you have read some of the others, please correct me), so maybe this was just as good as any of the others to start with. Out of the three books in this post, this one would appeal to the youngest audience for sure. Because of the length and all the illustrations, I think kids even as young as four-years-old would enjoy it. I didn't think I could love this book any more than I already did, but reading it to my kids bumped it up to a whole new level. 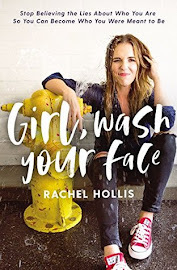 The funny lines were funnier, the poignant parts were even sweeter, and basically, it was just what I needed to read this Christmas season. There are six Herdman kids, each one worse than the last. Their father is in jail and their mom spends as many hours working as possible . . . and not just because they need the money. They swear and steal and manipulate and torment at every possible turn. The only reprieve anyone ever gets from them is on Sunday at church because no Herman has ever set foot inside a church before . . . that is, until Charlie opens his big mouth and says they get dessert during Sunday School (which is entirely untrue--he just says it to make Leroy Herdman jealous). But with that sort of incentive, the Herdmans think they might just give church a try as well. They just happen to go on the Sunday right before Thanksgiving when announcements for the upcoming Christmas pageant are given, which intrigues them. And if there's one thing anyone has learned, it's that you don't argue with a Herdman, even if they want all the leads in the Christmas pageant but have never even heard of Jesus (except when they're taking His name in vain). 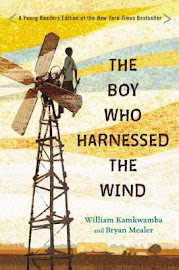 The book begins with the line, "The Herdmans were absolutely the worst kids in the history of the world." And as we made our way through the first chapter and we read about how they set fire to an old toolhouse and let loose their deranged cat during show-and-tell and memorized everyone's weight just to use as blackmail, my kids' jaws dropped little by little until they were convinced that it was true. The Herdmans really seemed like they must be the worst kids in the history of the world. But it's kind of amazing how your perspective changes when you learn a little bit more of their story and also how opening your heart a little bit can add a new kind of depth and perspective to the Christmas story as well. The Herdmans have never heard of Mary or Joseph, so of course they're indignant when they learn that the inn was full and the only place for Mary to have her baby was in a stable. And they've never heard of the wise men or frankincense or myrrh, so of course a ham makes more sense as a gift. To strip down this holy and well-known story to its most basic components brings it to life in a new and vivid way. And seeing the Herdmans' reaction to it really exposes their hearts, which, believe it or not, they do in fact possess. Part of our family scripture study during the month of December comes from Luke 2, and my kids' ears perked up more than usual when they heard familiar phrases, for example, "Mary . . . being great with child," and Max interjected, "You mean PREGNANT?!" Yes, they were maybe a little more irreverent, but they were also more focused and attentive, which seemed like a good tradeoff. But speaking of irreverent, I was a little worried before starting it that the Herdmans might be a less-than-desirable example for my kids (and sometimes even the suggestion of something naughty can make it seem more appealing). But while I will admit to a little judicious editing, overall I kept the story intact because it's pretty much perfect, just the way it is. And as we came to the end and then the very final line when Gladys Herdman yells out the words, "Hey! Unto you a child is born!" my voice caught and I couldn't choke them out. All of a sudden, they meant so much to me, those words, maybe more than they ever had before. "Unto you a child is born." Unto you. Of course that's news worth shouting. Again and again and again. Did you read any fun holiday books with your kids this month? I'd love to hear about them! And I hope you all have a wonderful Christmas! Oh yes, I'm pretty sure I heard about it from you first!